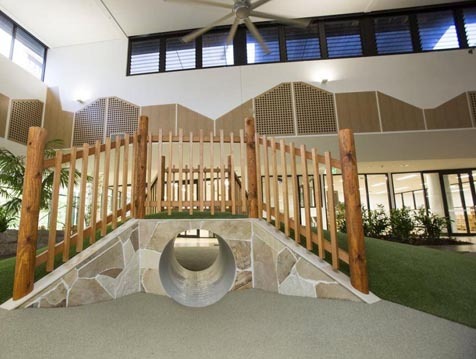 This tropical oasis Early Learning Centre is located in the heart of Brisbane’s CBD. 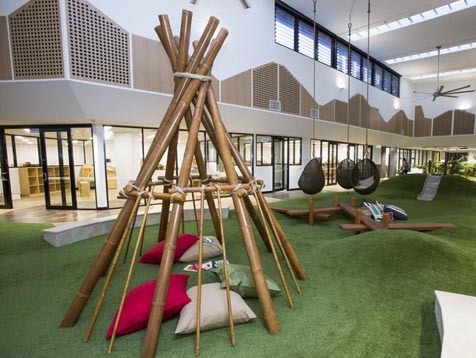 Designed by Gray Puksand, the team has overcome a number of challenges to design a unique and creative Long Day Care Centre and Kindergarten for the local community. The project encompasses the entire level of the old iconic Broadway on the Mall building and generates a world-class play-based learning centre for children. The heritage-listed façade lacks outdoor space, yet feels open and spacious when inside due to the clever design principals employed by Gray Puksand Architects. The stunning atrium designed learning space creatively brings the outside in, for children and carer’s to maintain a sense of connection with their outdoor surroundings whilst inside the building. Breezway Powerlouvre Windows have been installed up high to help maintain this sense of connection to the outdoor world and are electronically controlled to allow natural ventilation in when required. 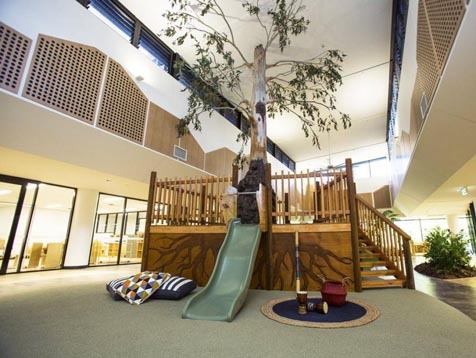 Naturally ventilated spaces have been proven to increase emotional wellbeing and learning outcomes for young children. 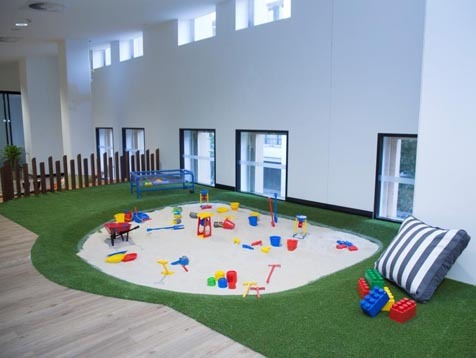 There are 14 separate classrooms which all open out onto the playground area so children can interact with nature and areas for exploration and learning. Some of these features include sandpit, water pump features and herb and vegetable garden designs that were generated through the help of landscape architects and engineers. A collaborative effort was also established with Goodstart’s team in order to provide appropriate equipment, support facilities and environments for each of the age groups. The facility also provides children the opportunity to learn about nutrition and will be able to serve themselves lunch freshly created each day by an onsite chef.